TOGETHER against evictions. Unite union flags on tenants' demonstration. Which side is Labour on? 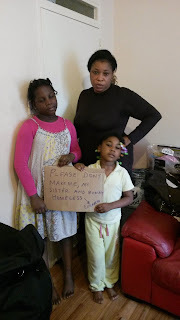 HOUSING campaigners and other friends are going to Lambeth County Court on Friday to show support for a worker from St.George's Hospital, where I used to work, who is facing eviction from her home, with her two kids, - by a so-called charity. Marian is a Guinness Trust assured shorthold tenant (AST) and she has been living in Kenwood House in Loughborough Park since 2007. Due to the ongoing regeneration of the estate, Guinness Housing Association are taking Marian to court to get possession of her flat which she shares with her two children aged 4 and 8. Marian is one of the last AST tenants who has refused to leave to make way for Guinness to demolish her block. She is a healthcare assistant in St Georges Hospital and cannot afford private rents in London - she is demanding alternative affordable accommodation. The campaign by Guinness ASTs has meant that almost all the other ASTs who resisted eviction have been rehoused and nobody has been forcibly evicted. Campaigners want to show Guinness that Marian has strong support to resist any attempt to evict her too. The Loughborough park estate in Brixton was a 1930s estate of 390 social rented flats – until Guinness began their regeneration programme to demolish it and replace it with 487 new-build apartments. 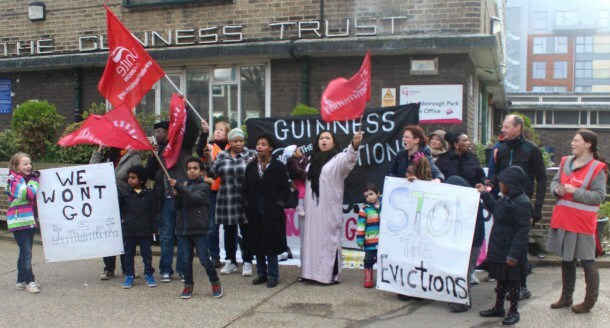 When Guinness started on this regeneration strategy more than a decade ago they decided not to take on any more housing association tenants with full life-time tenancy rights and as vacancies came up they brought in ASTs (assured shorthold tenants) who could keep the buildings occupied temporarily before they bulldozed them – but would not need to be rehoused by Guinness when they evicted them. Many of the existing tenants, however, were not happy with the regeneration plans and opposed the move to new high-rise blocks which would lead to higher rents and would destroy the beautiful old buildings on the estate which had a unique architectural value. They lobbied and challenged the planning process and tried to set up their own tenants association but were blocked by Guinness and eventually ignored by Lambeth council. MARIAN is NHS Care Assistant. Who cares about her and her children? The battle on the Guinness estate is part of the ongoing struggle for living space in London which has intensified under this government. "Regeneration" becomes a formula for property development that forces working class people out of neighborhoods and even out of the capital, housing benefits are capped while rents are allowed to soar, and new developments bought and sold for profit and even money-laundering while even people in good jobs haven't a chance of buying. With some 40 per cent of council homes sold under Thatcher's much-vaunted "right to buy" policy now in the hands of private landlords and property companies, the Tories have promised to extend this to housing associations - though it would impinge on their charity status, and the cost would be subsidised at the expense of councils building new homes. Some Tory councils in the capital have waived any obligation on builders to provide affordable homes, and made it clear they don't want working class and poor people in their borough anyway. But some Labour councils too have proved unable or unwilling to resist the trend, and are telling homeless families they must move hundreds of miles away if they want to be housed. For all it's called "Conservative", the government can be radical when it is taking away our rights, be it in the workplace or at home. Anticipating more homelessness, and people ready to take desperate measures whether individually or organised, Cameron's Con-Dem coalition introduced legislation turning squatting of empty homes into a criminal offence. Some people seem to have decided this was not going far enough. Last year the social media repeatedly carried a news story from the London Borough of Redbridge about police snatching food and sleeping bags or blankets from homeless people who had taken shelter in an unused building. People who read about this were rightly incensed about this nasty, brutal behaviour by the police who, though acting on their own initiative, said they had been asked to discourage vagrants from using the premises. But if some Labour politicians had their way such actions would be more general and much worse. I have visited several of these places and I am well impressed by their achievements. Did those three visit any of these establishments or were they running on the pure, unadulterated juices of prejudice, hearsay and the tired old Tory canard of squatters stealing peoples homes? - See more at: http://housingactivists.co.uk/squatting/look-back-anger-lambeths-betrayal-commitment-social-housing/#sthash.S0Y6RwEs.dpufLib Peck is the leader of Lambeth council, and I was told there was a particular local problem over the West Norwood library site. But whatever the rights and wrongs of that, by turning to the Tory government and asking for it to extend its laws, the Labour trio were opening the door to further oppressive action against the homeless, against community and cultural groups that have made some very creative use of empty and often derelict buildings in Lambeth and other places: and potentially also against workers or anti-cuts campaigners occupying premises to resist closures. It is a far, sad cry from the days when Lambeth Labour was used to being branded "loony left" by the press because it tried to resist the Tories and defend services to local people. So whose side is Labour on, the property speculators or the working people? Most Labour people I know would indignantly reply "the people of course!" But look again at those names. Chuka Umunna was elected MP for Streatham in 2010, and the following year made Shadow Business Secretary. Calling for Labour to target Conservatives and "aspirational, middle-class voters", he said the party needs to be "on the side of those who are doing well,. "and on May 12, announced his candidature for the Labour Party leadership, only to withdraw it three days later. But he has not desisted from acting as a voice for the Right, and warning us what awful things will happen if we vote for Jeremy Corbyn. Tessa Jowell, MP for Dulwich and West Norwood, which if I'm not mistaken covers the Guinness estate at Loughborough Junction, served in both the Blair and Brown governments, while her international business lawyer husband ended up serving time in an Italian prison as a result of the money-laundering and bribery linked to former Italian prime minister (and Blair chum) Sylvio Berlusconi. Jowell is now hoping to be Labour's candidate for Mayor of London, and presumably also hoping that voters remember her part in securing the Olympics for London, rather than asking whether she really knew nothing about her husband getting Berlusconi to pay their mortgage. There's certainly nothing about it in the letter I've received from "Trade Unionists for Tessa", signed by John Hannett, general secretary of USDAW. A lot of my friends seem to be supporting Diane Abbott for mayor, while my union's London region is backing Sadiq Khan, currently MP for Tooting. Like a lot of Unite members I was surprised just after the general election to receive a 'phone call from someone in a union survey team asking my views about the mayoralty. Contrary to the story that appeared in Private Eye, they did not mention any potential candidates, but asked what I thought should be priorities. I said something about housing and might have also mentioned transport, and I probably was not alone, as together with a Living Wage, these are taken up in Sadiq Khan's leaflet. The Loughborough park estate in Brixton was a 1930s estate of 390 social rented flats – until Guinness began their regeneration programme to demolish it and replace it with 487 new-build apartments. When Guinness started on this regeneration strategy more than a decade ago they decided not to take on any more housing association tenants with full life-time tenancy rights and as vacancies came up they brought in ASTs (assured shorthold tenants) who could keep the buildings occupied temporarily before they bulldozed them – but would not need to be rehoused by Guinness when they evicted them. Many of the existing tenants, however, were not happy with the regeneration plans and opposed the move to new high-rise blocks which would lead to higher rents and would destroy the beautiful old buildings on the estate which had a unique architectural value. They lobbied and challenged the planning process and tried to set up their own tenants association but were blocked by Guinness and eventually ignored by Lambeth. “Last week, the political Establishment figures watched as I was undemocratically excluded from appearing on what was supposed to be an election hustings broadcast on LBC radio,” Christian Wolmar said. “Now, it is reported that three of my Labour Party rivals for selection have been having their campaigns generously funded by property developers. It had already been established that Dame Tessa Jowell received £10,000 towards her campaign from the chairman of Chime Communications, the company founded by Mrs Thatcher’s former spin doctor, Tory peer Tim Bell. Dame Tessa has since taken an executive job with a Chime subsidiary. Now Property Week reports that Canary Wharf Ltd has given £11,500 to the Jowell campaign, which has received another £5,000 from the former chairman of Land Securities. Sadiq Khan’s campaign has received nearly £40,000 in donations from three major property developers. And David Lammy’s campaign has racked up donations amounting to almost £40,000 from various companies and individuals with multi-million-pound interests in property development in the capital. Christian Wolmar said: “How can these Labour Party candidates for London Mayor say they will drive a hard bargain with developers while taking money from them? Remember Deir Yassin - and Forget Paul Eisen! Blood Money promised, then postponed. The 'Mail' finds a link - or does it? Could Spin Turn Flip to Flop? Not all Angels, but Not Just Victims Either.